Produced by two Washington-based, non-partisan and independent non-profit institutions, the Hutchins Center at Brookings and the Serious Games Initiative at the Woodrow Wilson Center, and relying on the advice from an advisory committee that represents a broad spectrum of political views, The Fiscal Ship is a new Serious Game that challenges players to put the federal budget on a sustainable course. 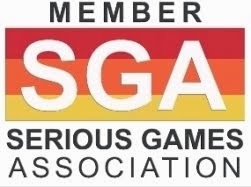 The independent game development studio behind it is 1st Playable Productions. Funded by the Peter G. Peterson Foundation, the William and Flora Hewlett Foundation, and the Lounsbery Foundation, who exercised no editorial control over the game, The Fiscal Ship is playable for free on phones, tablets, and desktops. David Wessel spent 30 years at the Wall Street Journal, and he says he never figured out a good way to explain the federal budget. Now that he’s at the Hutchins Center on Fiscal and Monetary Policy at the Brookings Institution, he’s trying again—with a video game. Please find the extracts of his article “Why We Made a Computer Game about the Federal Budget” at the bottom of this post. The growing mismatch between revenues and spending challenges policymakers to face tough decisions and trade-offs in order to reconcile government priorities such as retirement and health benefits with the tax revenues that the current tax code would yield. The game basic assumption is that today’s tax code won’t yield enough revenue to pay for basic services of government plus the retirement and health benefits promised to the growing number of old folks. 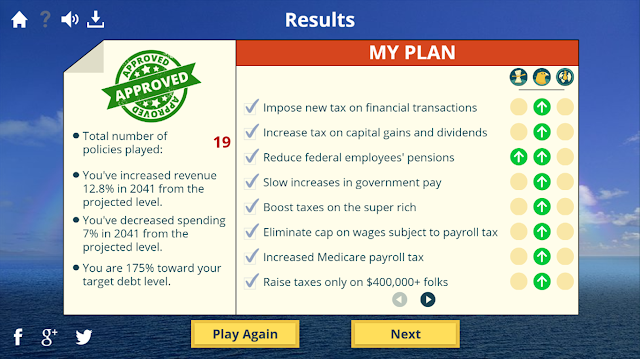 In the game, players’ mission is to pick from a menu of tax and spending options to reduce the debt from projected levels over the next 25 years. Small changes to spending and taxes won’t suffice. The choices are difficult, but the goal is achievable. 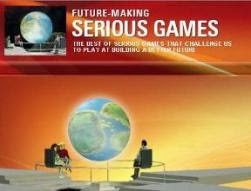 Game premises define fiscal sustainability as lowering the ratio of the federal debt held by the public to the gross domestic product in 2041 from a projected 130% to 75%, roughly where it is today. Although there is no consensus on just how much debt is “sustainable,” experts are generally in agreement that the current trajectory of ever-rising debt is economically risky. The 25-year baseline is built from Congressional Budget Office (CBO) projections for revenues, outlays and deficits assuming current law. The developers construct their baseline—that is a projection for the debt assuming no changes in tax or spending laws—by beginning with the most recent CBO 10-year estimates, and then extending each component of the budget at the growth rates assumed in the most recent longer-term CBO outlook. 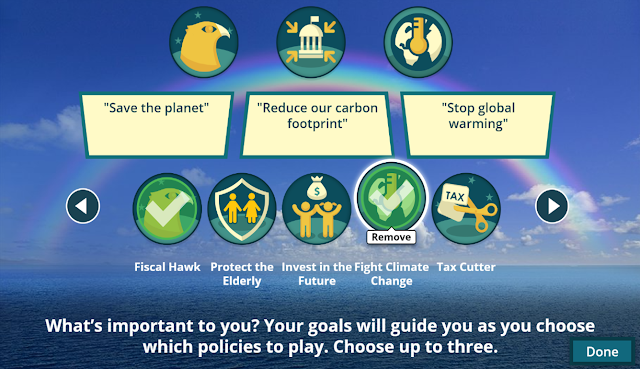 Reduce Inequality, Strengthen National Defense, Fight Climate Change, Strengthen Social Safety Net, Tax Cutter, Shrink Government, Protect the Elderly, Invest in the Future, Fiscal Hawk and Rein in Entitlements. Then the player picks from ~100 tax and spending options (both increases and decreases) to achieve those goals and bring the debt-to-GDP ratio down from a projected 130% in 2041 to 75%, roughly where it is today. In other words, winning requires both achieving your governing goals and stabilizing the debt. The point: It is possible to stabilize the federal debt and pursue other objectives simultaneously, but it takes some hard decisions about taxes and spending to do so. Budget decisions aren’t only about fiscal sustainability. They also shape the kind of country we live in. To win the game, you need to find a combination of policies that match your values and priorities and set the budget on a sustainable course. 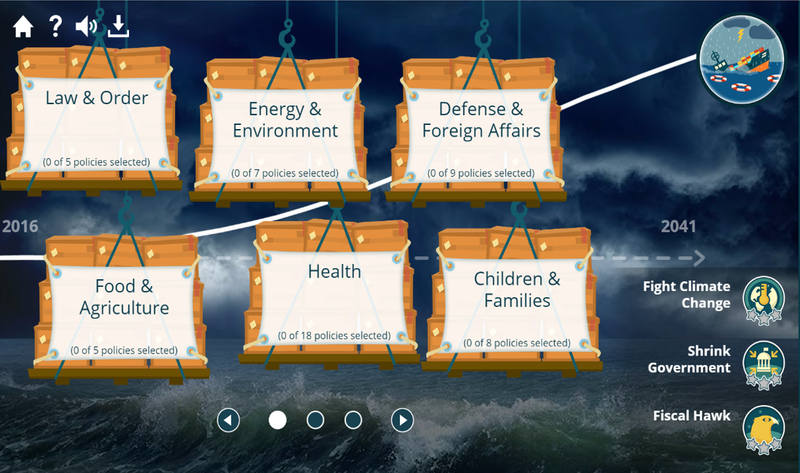 Policy options in The Fiscal Ship come from a wide range of sources: CBO’s Options for Reducing the Deficit, presidential candidate proposals, President Obama’s budget, other think tanks, and government agencies. Wherever possible, the creators began with cost estimates from CBO, the Office of Management and Budget, the Social Security Administration, or the Urban Institute-Brookings Institution Tax Policy Center. These estimates typically cover 5 to 10 years. They extend them to 25 years. For policies not scored by these organizations, estimates were developed by Hutchins Center staff. All of their estimates are approximate. The Hutchins Center staff, with input from the advisory committee, chose the tax and spending options. They aimed for policies most discussed by budget experts and policy wonks and those most frequently mentioned by presidential candidates. They don’t pretend this is a comprehensive list; rather, they wanted to offer a wide range of options to both reduce and increase spending from projected levels and to raise and cut taxes. 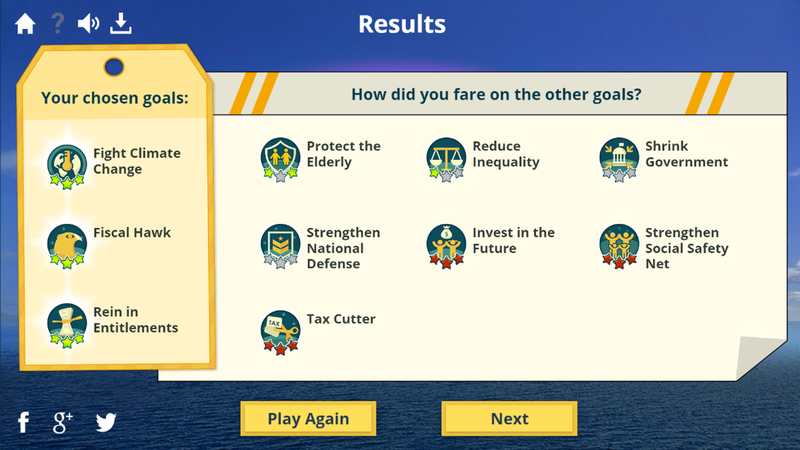 For each goal, they selected from the policy options in the game those that they judged would take the country closer or farther from the goal, weighting them to reflect the fact that different policies impact the goals to varying degrees. Some players get a notification that they “couldn’t win the game with their governing goal combination”. 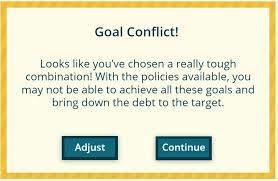 Most of the combinations of goals in the game make it possible to find many winning policy combinations. However there are a few possible combinations where you can’t earn 3 stars for multiple goals while still bringing the projected debt/GDP ratio down to today’s level. Most of those combinations involve the Tax Cutter goal for one simple reason: the more you decrease revenue, the harder it is to find a way to decrease the debt—you have to decrease spending even more to make up for losses in revenue. In the real world, you might be able to find or create policies that could make it possible to reach all the goals and reduce the debt, but in the game developers limited options to the policies most discussed by budget experts and policy wonks and those most frequently mentioned by presidential candidates. 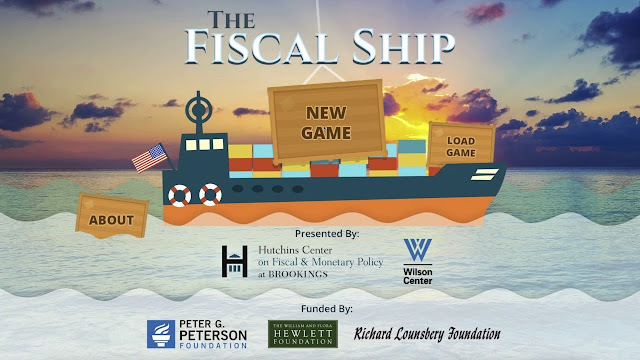 The Fiscal Ship game shall be presented at the Games+Learning+Society 12 Conference, Thursday, August 18 • 11:30am - 4:30pm, by Eric Church from Serious Games Initiative - Woodrow Wilson International Center for Scholars, and Emilie Saulnier from 1st Playable Productions.